I think the most fun part of decorating is adding the details that finish a room. It’s all about the details. And for me, that usually comes at the end of the decorating process. 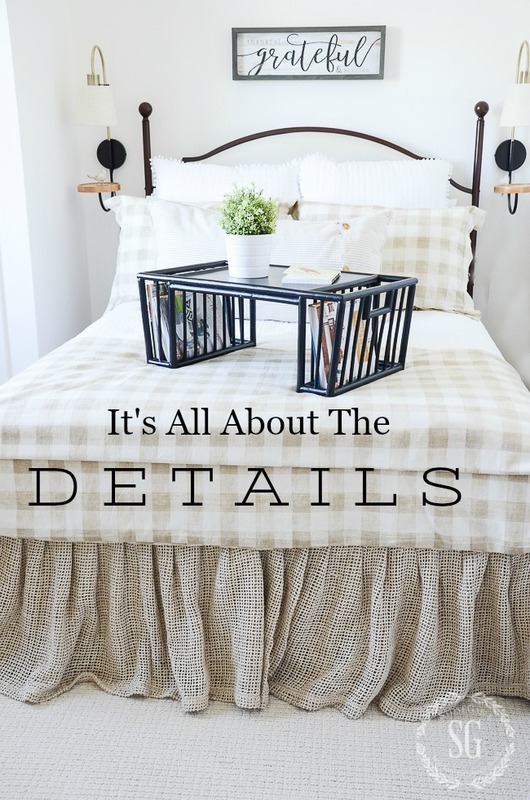 Attention to the details in a room really makes the difference between a room that is nice and a room that is amazing! Let’s look at decorating with details. 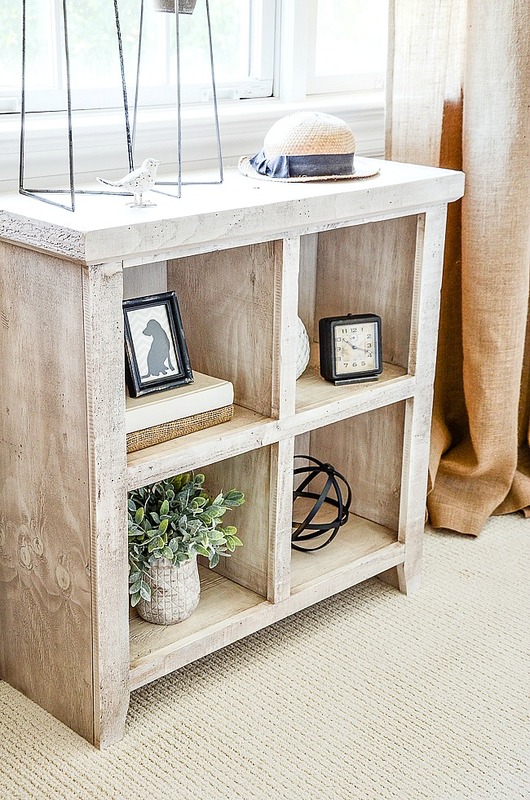 Here are 5 tips to help you get the details in your room right! Accessorize the rooms in your home like you accessorize your wardrobe. Too much jewelry can look overdone and garish. But too little can make you look plain. Same goes for your room! Your eye needs to land on places that it thinks is interesting and also needs space to rest. My Gable guest room is very sunny and has a light, clean feel. So I didn’t want to overpower my room with lots of details. I paid attention to things like drapes puddling on the floor and a great pattern on the rug! Even the littlest detail should not be overlooked! It’s all about the details, so let’s layer them! Layering decor takes a bit of practice and a little time to play. Add a throw and a bed tray to a bed or a vignette to a coffee table. It’s like layering lots of bracelets to your arm. And who does not love an arm jangling with blingy bracelets! The bed is layered with a white malaise quilt and a checked duvet cover, sans duvet. Perfect for warm weather. And of course a bed tray. I love to use them and they make a nice statement on the bed! When you think you are done accessorizing, look again! And again! Make sure your accessories are balanced. Not too much on one side of the room. Look to see if your room needs a little more detail or a little less. Your eyes are the best judge. Leave the room and come back to it later. 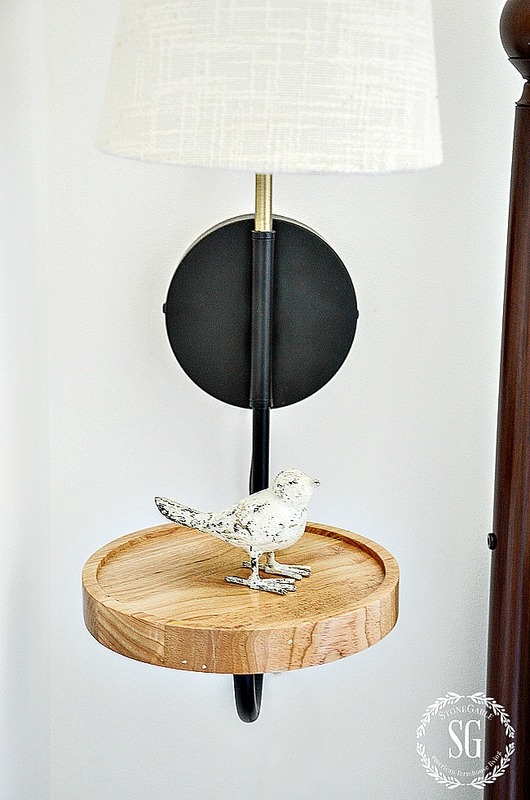 Give it a very critical look and readjust your room details as needed! The small chest under the window is decorated with a light touch. I was mindful of the dresser on the other side of the room. I say this so so often! Before you go out and buy anything look around your own home! I bet you have some pretty terrific accessories that would look amazing in the room you are decorating! The dresser in the Gable room has such a pretty top so I don’t clutter it up. I like to put a dish or bowl in all my guest rooms for guest to put their rings or keys or change in! The lamp, sign, and dish came from other rooms in my house. Are your accessories and details collecting dust? Maybe you need to rearrange them. Change details often. It’s fun and keeps your rooms from getting boring! Pick a room… any room and look around with a critical eye. 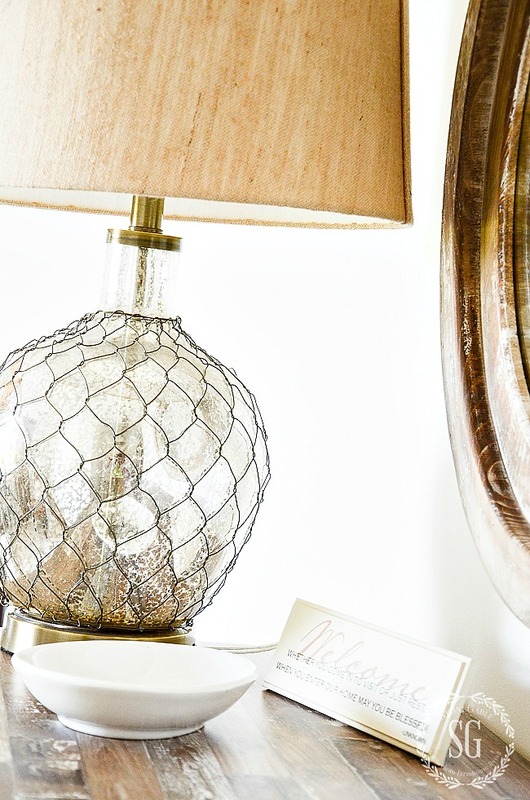 What details can you add to your room following these 5 tips? And I would love to see what you have done. Take a picture and send it to me!!!! You might like to follow me on Pinterest and see what I’m finding to pin daily. Click HERE to follow. My DECORATE MY HOME Pinterest board has almost 1,000 pins of gorgeous home decor! I want to work on layering my bed for this winter. This gave me great ideas as usual! So many gorgeous details. I love the bed skirt! Wow, you truly decorate with so much class, elegant and fabulous flar for fablous designs. Thank you for sharing. I also love those bedside lamps, but how to you turn them on and off? There is a little switch on the round base. I absolutely love the sconces, a shame they are no longer available. Yvonne, I just don’t get the idea of puddling drapes. Don’t you worry about getting your foot caught in them or how do you keep them hanging straight? We aren’t lucky enough to have those nice large bedrooms like you do, lucky girl. Is this mainly for drapes that are stationary? I know I’m old fashion, they just look like they need to be shortened. Help me fall in love with this idea. 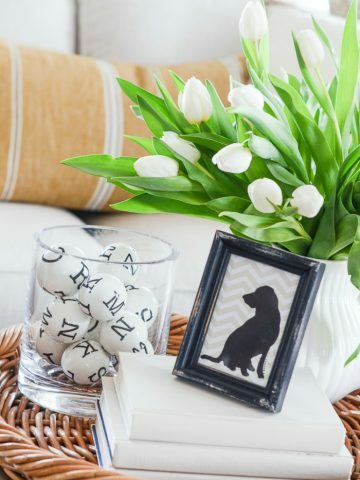 Yvonne, I recently discovered your post and was just enjoying Decorating Details. It’s all about the Details. I love your help on texturing, and accessorizing. Not too little and not too much. It’s a wonderful blog and I will be a regular follower. Stunning room Yvonne – and stunning website. Like almost everyone else I was so taken by the bed skirt. Thinking I might try making one in hessian! Thanks for the inspiration. Reading your posts is such a joyful experience. You are so right – it is all in the details. I could always figure out the “big” stuff but the details challenged me. Your blog has made such a difference in helping me become much better at the details. Thanks for all the ideas and tips! Your talent for decorating is evident throughout your gorgeous home!! The room looks awesome, love the bed skirt!! The room really looks perfect and beautiful I liked your choice for the curtains they add a pleasant look to the room.Great work!!! Thank you, thank you, thank you for finally getting around to sharing some of the sources for this room! I see you did change some of the bedding up a bit from when you first shared the room with us but what a great idea to buy bedding that coordinates and change it up to refresh on occasion. I like both looks and couldn’t pick just one if I had to. 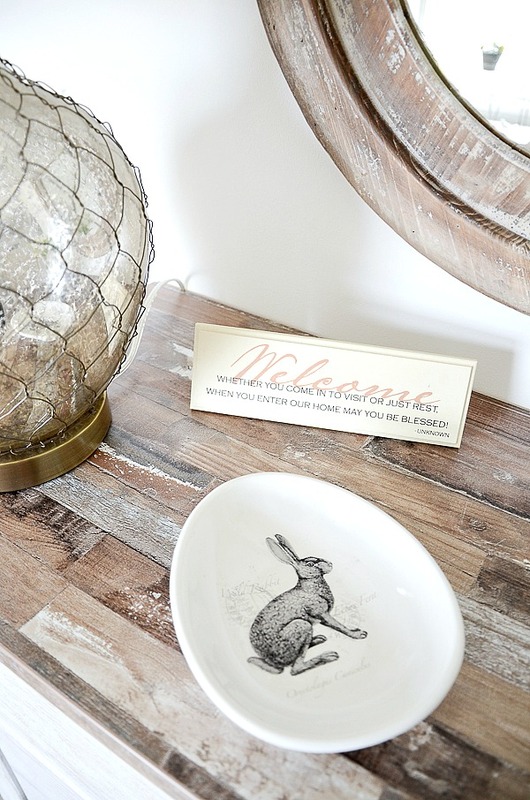 As far as sources go do you have the source for the planters and bird on the bookshelf, the dresser and that cute little welcome sign? Love all your posts, but this one especially for all the good ideas! I love the little Welcome sign on the nightstand! Everything looks amazing, thanks for sharing your ideas. The details that you add everywhere are amazing! What a beautiful guest room! Love the gingham duvet and pillow shams. Love this room and thanks for all the great tips!!! I love this bed-skirt. Its lovely and I love the color with the black iron bed – beautiful! So welcoming…. liking all that texture….and that bedskirt is beautiful. Now we all know why you have so many guests. Better than the best B and B. 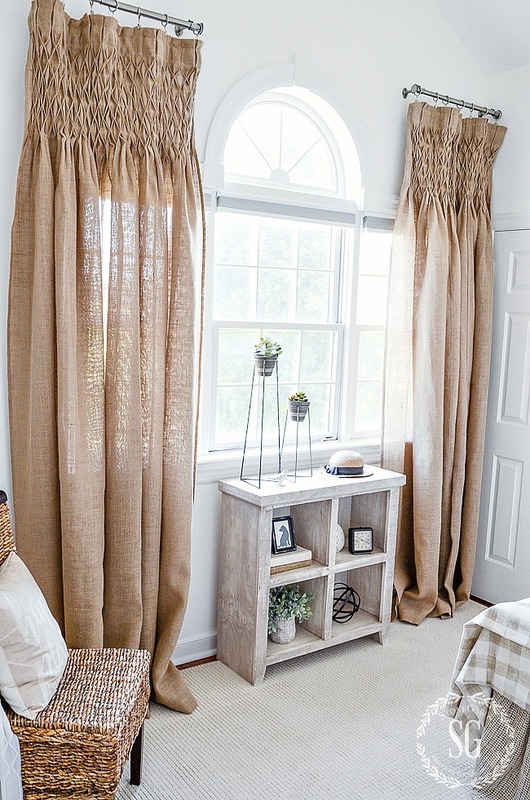 Love the neutral colors and especially the curtains and bedskirt. I’m loving your guestroom and the color palette you chose. I think we all can relate to today’s post especially downsizing accessories, for me I love beautiful décor and tend to go overboard. Also, I just want to say that I love all your tips and tricks and who cares if you make a spelling error, we know what you mean. Keep on doing what you do best because we love you and what you stand for. Beautiful room! I especially love the smocked curtains. They are so unusual, but don’t appear as they would provide much privacy. I don’t remember. Did you provide their source? The pretty side drapes are just for decor, Phylis. If you look, you will see there are blinds on the windows; they are just pulled up. Love your guest room! It makes me want to come visit! ? Love the details! I see you’ve moved the orb from your living room to the guest room. Unless you made more than one! Have started shopping my home. Fun! I have a guest room I’m still working on but once I’m finished I’ll send a picture. Thanks for all the decorating suggestions. Sometimes I need a nudge to get my brain thinking! From my friend Pinky at Designs by Pinky: I just did this to the sitting area of our master. I decided that I wanted a “British Colonial” look. I had everything I needed in the house, didn’t have to buy a thing. I am loving the new look!!! I’ll try to send you a picture. I am also trying a new email address to see if my comments will show up. I still don’t understand why they don’t. We’ll see if this works:) MISS YOU!!!!!!!!!!! 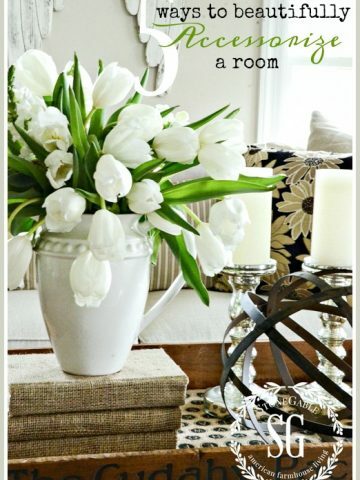 Wonderful decorating tips! I have learned so much from you & your blog! Thank you! Love your guest room! Hi Yvonne. Love the guest room. Have to say it was nice to see that you have the same bedskirt that I have in our master bedroom. I even got the matching Euro shams. Love the raw silk with the rest of our bedding in shades of teal. Thanks again for all the great ideas. A “White MALAISE (?) Quilt” I’m sure you meant Matelasse. You never want decor to suffer from “Malaise”. I’d just blame “spellcheck” if I were you. Yvonne, you always make your rooms look so visual welcoming. I love your guess room,especially the duvet and shams on the bed. Have a great day! I love this room. It is so warm and inviting. Am I seeing some sort of blinds that are pulled up on the windows for covering at nighttime on the window? Yes, you have a great “eye”! Love the entire room….you did a fantastic job putting it all together! The room is beautiful. I will have to use your tips for my guest rooms! 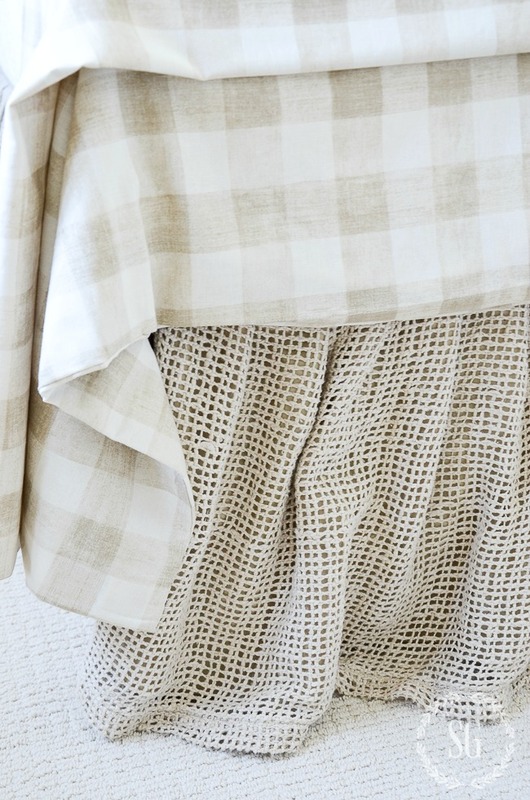 I love the checkered duvet with the open weave bed skirt, they are perfect together. I use the same things that you use in your accessorizing list, but I don’t have any orbs. I will definitely have to find some. I also re arrange things frequently for a whole new look, that’s part of the fun of accessorizing! I love the way you placed the drapes. I am going to copy the idea. Do you have a resource for the drapes? Combining the textures in this room comes off perfectly. Bedskirt balanced against drapes and bedding! Brenda, I put the source at the end of the post. Harriet, it is a standard size so regular bed skirts will work just fine. What a soothing, beautiful guest room! That bed skirt really sets off the whole bed. I love everything about this room! Beautiful! 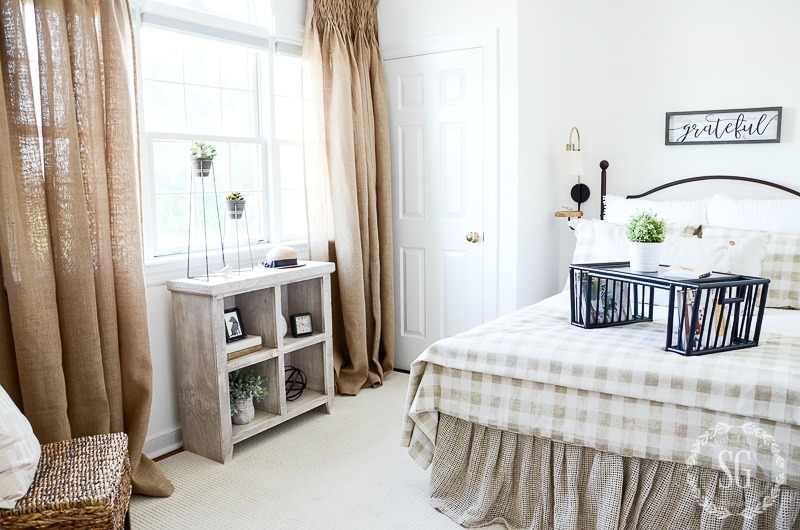 Love the natural and neutral bedroom!!! AWESOME!! I love the bed and lighting. How high off the ground is the bed. I have trouble finding a bed skirt that is long enough. I love that bedroom! It’s just beautiful. Great tips Yvonne – thank you! Those lights on the side of the bed are unique. I have never seen those before. Where did you get them? Hi Phyl, they came from Wayfair and are no longer in stock. I keep looking for them though. When I see them again I’ll post about it. Where did you get the bedskirt? Or did you make it? The bed skirt came from Soft Surroundings. They have such gorgeous home decor and fashions! You always have the best ideas. Now it is time for me to put your ideas to work. Going to do this today. Thanks for sharing, enjoy your Monday! I’m thinking I may go “shopping” today (just around my home) looking for some detail treasures! Anyone free to come and shop with me? I’d love it! You are so right! Details make such a difference! I love your suggestions for layering accessories and adding wonderful texture to make a room visually welcoming and warm! Loved seeing your home featured in Autumn issue of Cottage Journal. Congratulations. Can’t wait to start fall accessorizing with old and new items. Your guest room is so simple but so welcoming. Love the drapes and bed skirt. Where can I purchase your open weave linen redshift? 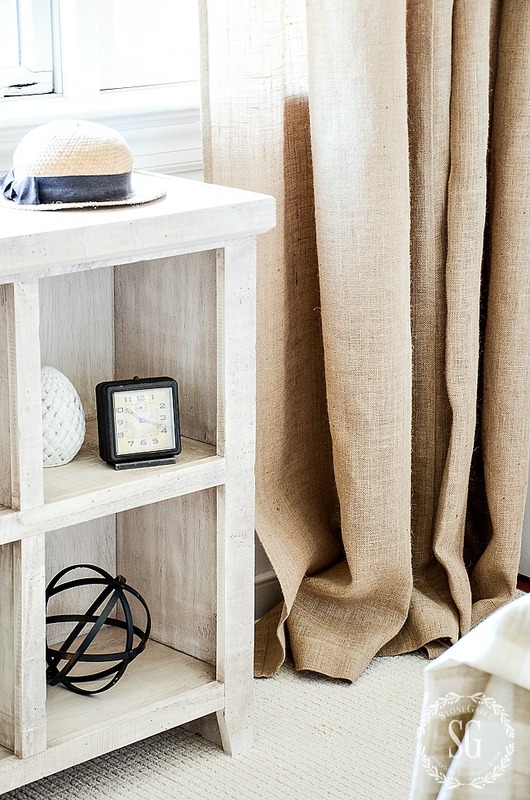 Creating a breezy West Indies inspired guest room and your redshift would be a perfect addition. Thank you for the inspiration! Hi Mary, I put a link to it at the end of the post. What wonderful ideas for decorating! I probably could do some serious evaluation per room….but I do move things and shop my home a lot! You have such a lovely style! Thank you! Terrific looking room Yvonne. Where did you find the buffalo check duvet and shams…..love them. I just added the info at the bottom of the post. Thanks for asking! Love the bed!!! So pretty!! Great room! Where did you get the sign behind the bed? It is perfect! There is a link to the bedskirt at the end of the post. The sign came from a local shop. What a beautiful guest room! I like your idea of accessories being like jewelry. Puts a fun spin on decorating a room. I also need to take your advice on changing accessories often – not just at Christmas!